Hey there crafty friends! Today I’m on the Scrapbook Circle blog featuring 2 cards I made using the July Laugh More add-on and the July Smile More kit. I just love the Pinkfresh Studio Dream On collection, and the products were perfect to make handmade cards! Stop by the Scrapbook Circle blog for more photos of the individual cards! Hey guys! I’m on the Scrapbook Circle blog today featuring the DIY fringe included in the July Smile More Kit as a part of 1 Product 2 Ways. The letters are from the July Laugh More add-on. I inked up one of the DIY fringe with Distress Ink in picked raspberry and an ink blending tool to match my daughter’s glasses. I also made 2 strips of my own fringe with pattern paper. I love how the layers of fringe and the tiny flowers that I hand cut kind of echo the florals behind Ellie in the photo. Stop by the blog for more info and photos, and to see how Tessa used the DIY fringe! P. S. how is my daughter 7 already! GAH!!! Today I have a layout on the Scrapbook Circle blog created using the July Smile More kit. The alpha is from the July Laugh More add-on. I finally got around to scrapbooking the zoo trip we took several years ago to our favorite zoo in Waco, TX, the Cameron Park Zoo. I’m happy to have it done, and ready to go in the album! The Perfect Day bear sticker is a Shimelle sticker which came in one of the past kits, but I just couldn’t help but put it on this layout…it’s perfect! Stop by the Scrapbook Circle blog for more pics and info! Hey there crafty friends! Welcome to the Altenew Scrapbook Collection blog hop! I am so excited to be taking part in this blog hop! I will be using the beautiful Reflection Scrapbook collection from Altenew. 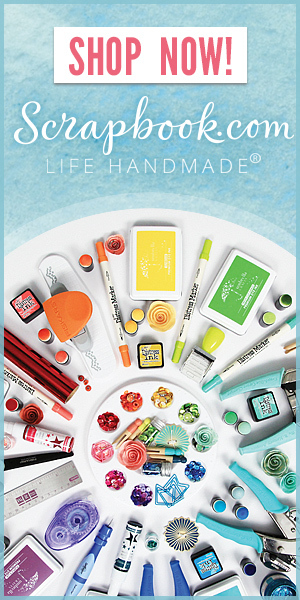 This kit has everything you need to create gorgeous projects! Today, I will be sharing a layout I made using the Reflection scrapbook collection. First, I backed a heart cut file with pattern paper from the collection. I chose colors that matched my photo, and I really love the water color look of these papers! I added some machine stitching to create texture. I layered some pattern paper under my photo. I also did a bit of stamping for my layout. I gold heat embossed a row of flowers from the Hello Sunshine stamp set on a piece of white cardstock, and layered that under my photo as well. I also stamped some flowers from the Painted Flowers stamp set, then I cut them out using the coordinating dies. I used those florals on the bottom right and the top left of my photo, layering and tucking them in front of and behind my photo. Beautiful is the title of my layout, which shows my sentiment to the photo. I used the scripted acetate piece for my title. I also added two acetate butterflies. I love the way the bold black pops against my layout. I finished off by making a tab out of pattern paper, and adding my date using the date stamp included in the kit. I included the “BEST DAY” sticker to add another bold black element. I adhered the journaling that I printed off from the computer and cut into strips. Some gold watercolor splatters and a little thread, and my layout is done! Altenew is currently holding a promotion. Receive a FREE Scrapbook Class when you purchase the Reflection Scrapbook Collection. Send Altenew an email at support@altenew.com with your order number and Altenew will set you up with free access to the Timeless Floral Layouts Class. Finally, Altenew is hosting a giveaway as a part of this blog hop. Altenew is giving away a $50 gift certificate to THREE lucky winners! Please leave a comment on the Altenew Scrapbook Blog by Wednesday, July 19, 2017 at 11:59pm EDT for a chance to win. The winners will be announced on the Altenew Scrapbook Blog on Saturday, July 22nd. *Also, I will be drawing a winner here from my comments. Comment on this blog post for a chance to receive a $30 gift certificate. I will announce the winner on my blog by Friday, July 21, 2017. Thanks for stopping by, and I hope you are inspired to get crafty! Hey guys! I’m on the Scrapbook Circle blog today with a mini album share and tips for fussy cutting. Every month, I take a picture of Ruby in a white onesie and a monthly sticker. I love to see how babies change and grow in their first year of life. I wanted to document my baby’s 12 months, so I thought a little mini album would be perfect! I used the July Smile More kit and the July Laugh More add-on. I hope you check out the blog for more photos and the fussy cutting tips!